Mass migration – the world’s migraine – is a violent battleground for political point scoring. We reported on April 2, 2018 just one example of how dishonestly opponents of Donald Trump paint his policies on illegal migration: they refer to it as his policies on migration. Not the same thing, of course. Recently (April 8, 2018) re-elected Viktor Orban, Hungary’s Prime Minister, is experiencing the same misleading tactic. His government passed a Holocaust denial law, made Holocaust education compulsory and financed an Oscar-winning film about Auschwitz (Son of Saul). His party has Roma (Gypsy minority) MPs. It has offered student scholarships to Syrians and Iraqis. Orban’s election campaign has been characterised as anti-mig­rant. That’s misleading. His campaign was anti uncontrolled, illegal migration, and the EU dumping people who claim to be asylum-seekers in Hungary. He believes a country should have some say in who enters its borders, a view, I suspect, many voters in Europe would agree with. Why is his reputation so bad? The former communists, until recently the main opposition, have suckered Western liberals, the left and the EU’s left-leaning management into believing that Orban is evil personified. So skilfully that The Guardian ran a ­column suggesting that voters should support the neo-Nazis in Hungary to dislodge Orban. You couldn’t make it up. I suggested the liberal democratic opposition … should form a tactical alliance with the illiberal democratic opposition, united in the populist radical right Movement for a Better Hungary or Jobbik … Liberals have a choice between remaining pure and facing the certainty of an illiberal state or “dirtying their hands” and at least fight for a liberal democratic future. 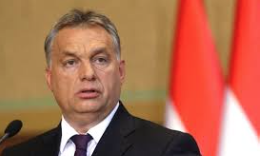 “Viktor Orban’s landslide electoral victory on Sunday, gaining 134 seats out of 199 in Hungary’s parliament, increases his governing supermajority and endorses his tough policy of excluding illegal immigrants, especially from the Middle East. His success dramatises a new reality across Europe and in Australia: a novel kind of party has emerged, disturbing the political scene and arousing impassioned debate. This is the beginning of an excellent analysis by Daniel Pipes, published in the same edition of The Weekend Australian.